This summer Rick Bowers of Candler tasted for the first time a tomato he grew himself in his own no-till garden. The multitude of flavors bowled him over. "It was like an epiphany that these tomatoes were so lush," he said. "The sensation was visceral because the flavor is so deep and rich. It kind of took me back to my childhood. I never anticipated it would be that great." As Rick's garden coach, I was relieved that the tomatoes were well worth the wait—and the work—it took to grow them. Rick, who spends almost all of his mornings in the sky above the mountains as the owner/pilot of Asheville Hot Air Balloons, is not used to waiting to eat something he put in the ground two months ago. And he certainly isn't accustomed to spending a full day laying out a 750-foot garden in the middle of January, only to let it sit four months before the organic layers had decomposed enough to be planted. During my seventh visit of the year with him, we chatted next to his garden now sprawling with winter squash, cucumber and melon vines. He was eager to understand exactly why the tomatoes taste so much better than the ones he bought from the store. After several months of consulting with him, I was very used to his why questions—and greatly appreciated that he was trying to understand the reasoning behind what he was learning so he could embed the knowledge in his mind. I explained that field tomatoes are usually picked when they are barely beginning to ripen, and only turn red in storage when treated with ethylene gas, which triggers ripening. If the tomatoes are instead left on the vine in the sun, the level of sugars are higher, as are the content of essential oils and other compounds that contribute to flavor. These volatile compounds start to evaporate, and the flavor begins to deteriorate, the moment the tomato is picked. Commercial growers are often limited in the varieties they can grow due to practicalities of mechanical harvesting and transporting. 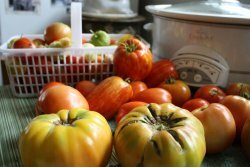 Since gardeners only have to walk their tomatoes from the garden to their own kitchen, they have the luxury of growing flavorful heirloom varieties with soft textures that don't travel well in boxes over long distances. Quality of soil also contributes to flavor. In the backyard garden, it's easy to maintain a high level of organic matter, which is the key ingredient in no-till gardens. As the organic matter decomposes, it unlocks the mineral content in the red clay Appalachian soil, turning it into a form that is available for the plants to uptake. Summer is perhaps the most satisfying season of garden coaching as my clients exclaim over the fruits of their work, but the rewards start early on, and in Rick's case, as soon as I sat down with him for the initial intake interview. The simple things intrigued him—that the corn kernels that we eat off the cob are also the seeds that we replant if we allow them to dry before removing from the cob. He was also surprised that popcorn is a similar plant to the corn he is well familiar with—it's just an extremely hard strain of Indian corn, high in protein and starch. The popcorn ear stays on the plant a lot longer than sweet corn, usually until first frost, when the kernels are completely dry and hard. Rick appreciated that I bypassed complex scientific explanations and delivered information in layman's terms. "I'm not interested in the scientific names," he said. 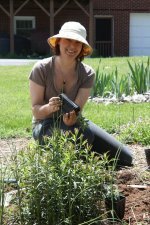 "I just want to know 'what do I need to do to grow the food.'" His learning style makes him well suited for my hands-on garden coaching program. "The way I learn specifically is I have to understand the logical foundation behind it," Rick said. "If someone can help me build a logical conceptual framework, then I can translate the information in my head. This is hard to do by just reading. It's important that I not just read about it, but see it in practice and talk about it. Megan was quick to understand that about my learning style and quick to accommodate that." He appreciated the student-directed educational approach that I use. "Megan was responsive to me and my questions without making me overly dependent," Rick said. "She wanted me to think." He was also impressed that I was actually doing the physical work with him. "She had said that she would be, but I didn't really anticipate that she was serious about it to that degree," he said. By harvest season, Rick gained trust in a gardening method that he was at first skeptical about. "I'm more convinced that I don't have to do the traditional till garden and have good results," he said. Plus we didn't use any chemical pesticides or synthetic fertilizers, he added. Sharing a story about eating cucumbers, he said, "All I have to do is rinse that thing off and I didn't have to worry about pesticides or chemicals. It's such a freeing event to rinse it off with nice cool water and sink your teeth in it." "I love the idea of being able to feel more self reliant," Rick said. "I love the idea that my property has a useful function instead of just a decorative function. It feels good in terms of stewardship of the property, in terms of ecology, and in terms of using the land for a higher purpose." Rick still has a lot of yet unfulfilled dreams for his property. Just as I repeatedly encouraged his patience in not wanting to grow too many crops his first year (which he later appreciated during the abundance of harvest season), I also reminded him that it takes time to create the perfect weed-free, grass-less paradise that is only possible with a good amount of up-front work and time. In the end, the independence he gained in gardening is the most fulfilling aspect to Rick. "That sense that I can take care of myself if I need to—and for my family if I need to—is incredible," he said. Rick is available as a reference for any potential M R Gardens clients. At 6,400-feet elevation at the Mt. LeConte dining hall in the Great Smokies, I found myself in a discussion about sustainable agriculture with fellow campers this summer. Under candlelight, we passed around the dinner table dishes of food that had been packed up by llamas and prepared on propane stoves in the dining hall kitchen. Considering the trip was completely out-of-the-blue and free to me, a gift from a friend whose injury prevented him from taking the 5-hour hike and using his cabin reservation, I was especially grateful for the meal and dinner companions. A couple in their early thirties, also very appreciative of the hot meal after a week-long backpacking trip, loaded up their plates. In between bites, Elle and James entertained us all with stories about their restaurant experiences and shopping endeavors near their home in Charlotte, where they try to accommodate their vegetarian son and celiac daughter, both under 10. Their efforts are further complicated because Elle and James also are committed to making consumer choices aligned with their ethics and values. I was impressed with their level of knowledge about the complexities of the food system—we covered many topics and a good deal of depth in a short amount of time. I'm encouraged that the many documentaries, books and articles about industrial agriculture have the general public's attention—not just the ears of people like me who have made sustainable agriculture their profession and lived and breathed it for nearly 15 years. Elle and James try picking their own berries with their children at patches near their house but are disheartened by just how long it takes to fill one container. They try to find eggs from chickens grown in humane conditions, but reading labels doesn't give them the information that they truly need to know about the farm to make a good decision. They try going to the area farmer's market, but have discovered that on weekdays it is just another grocery store "without the store," selling vegetables trucked in from thousands of miles away. They have to make special trips to the market on the weekends to make sure they are actually buying locally grown food. I was interested to hear more about Elle and James's frustrations with picking berries. I remember well what it was like to enter the world of physical labor after years of sitting at desks, whether I was in front of a computer screen or a university lecturer. I had to train my mind to give into the work and really enjoy the moment, instead of listening to internal complaints, usually about how long the task was taking or how the sun was too hot or how my back was hurting. These days, "frustration" and "berry picking" are not two things that turn up together in my life. I have learned to incorporate harvesting in my daily routine so that the activity enhances my life rather than burdens it. While my oatmeal is cooking on the stove, I step outside in my bare feet to the blueberry bushes just outside my door. The birds tweet away as they jump between flower stocks, and a floral scent emits with their movements. With the morning sun against my neck, I pay attention to the feel of the berry against my fingers before I release it and hear a "tink" at the bottom of my bowl. Read the rest of the article on the M R Gardens website. August and September are the perfect months to set up your initial intake interview so that I can help you design a landscape that is uniquely suited for your needs, tastes and lifestyle. Read about the typical timetable for M R Gardens "Full Treatment" garden coach clients.